The Official Site of Filmmaker Alrick Brown » Blog Archive » My New Favorite Movie! 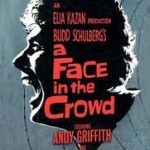 To understand the very nature of media and politics in the United States one does not have to look much further than Elia Kazan‘s A FACE IN THE CROWD. I recently watched it after much time ‘planning too’ and was blown away by Kazan’s direction, the cinematography (camera placement to be precise), the performances of all the actor’s particularly the work of Patricia Neal, and the writing of Bud Schulberg. The film also stars Andy Griffith and Anthony Franciosa. I knew the concept but still went into this one pretty blind and so should you. The trailer and synopsis, in my opinion, give to much of the film away. However, it is still a worthwhile journey. See this prophetic film to understand the presidency of George W. Bush, the fame and success of Rush Limbaugh, Glenn Beck, Sarah Palin, Snooki and to a greater extent the way politics, business, media and entertainment have become entangled. The political context of the film is a part of the reason Schulberg & Kazan put so much into this one. Like much of Kazan’s more intense work, it was produced after they were swept up in the anti-communist movement led by Senator Joseph McCarthy and the House of Un-American Activities Committee investigations. That is an aspect of Kazan and Shulberg’s journey worth looking further into. Art born out of the true complexities of life is always far more interesting. 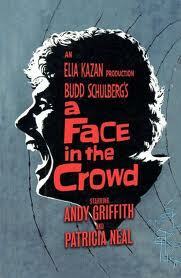 A FACE IN THE CROWD is one piece of such art that should not be overlooked. In fact, it should be required. This movie blew me away.I came away thinking 1957 it easily intimidated viewers.I’m movie buff thrilled with black and whites I’ve never seen that are amazing.Andy Griffith is nothing less than brilliant playing the perfect Narcissist.Superb supporting cast: Patricia Neal, Walter Matthau, Anthony Franciosa and Lee Remick.The movie grips the viewer from the opening to the final scene.Andy Griffith’s character immediately grabs attention then bit by bit as you watch it’s complexities unfold –his demons fueled and created by his radio image and the industry. “Lonesome Rhodes” megalomaniac things still go on today.This film was clearly ahead of its time.This movie is timeless, especially during election, we should all pay closer attention to candidates so we don’t wind up electing a “Lonesome Rhodes” character, egotistical, cynical and power hungry. A fine line, that is definitely crossed more times than we can count. Oh what a brilliant film! Marlon Brando gives his ceearr performance here in my opinion. Yes, even over the Godfather and A Streetcar Named Desire Love the blog, will check back soon! When u activate 3g first time on ur sim,u will get 250mb free 3g data,u won’t lose 2g data which was activated before but it can be used only with 2g mode.If above given trick works for anyone pls comment. About the AuthorI am an author and inspiration public speaker who teaches other authors and speakers how to maximize their efforts to increase financial and career goals. it’s unbelievable how much simpler and more enjoyable getting dressed is now. The trick is keeping it that way and not going through any type of empty-nest-like syndrome and refilling the space. Let me know how you do and I’ll do the same Thank you for reading & sharing! Congrats to you and your family. I was reading some other posts about the sickness. I was totally opposite. Horrible, horrible sickness 24/7 for the entire 9 months and had a girl. She was soooo worth it though!